Join us for the third Chigwell Footballers Golf Classic on Friday 30th August. Further information to follow shortly. 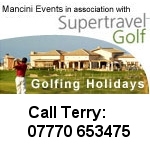 Please contact donna@mancinievents.co.uk 07918 644900 for anything meanwhile.